Matja Solce från Ljubljana gästspelade 15 & 16 februari med föreställningarna HAPPY BONES! och ATTENTION MOOSE! Matija är dockspelare, musiker, skådespelare, en otroligt mångsidig artist! I sina verk knyter han musik och teater tätt samman, förställningarna blir musikaliska animerade kompositioner med mycket humor! Matija räknas som en av de främsta inom den unga förnyade Europeiska dockteatern. Han har doktorerat vid Dockteaterakademin i Prag, och skapar nu nya projekt i de stora Dockteaterstäderna runt om i Europa varvat med turnéer världen runt. Språket i Matijas pjäser en härlig blandning av engelska och hittepåspråk, alla förstår! Vi har spelat tillsammans med Matija på Internationella Dockteaterfestivaler runt om i världen, fallit för hans roliga surrealistiska föreställningar. Till HAPPY BONES behövdes en musiker. Mats Andersson, professionell violinist som hörts både i Malmö Symfoniorkester och på Malmöoperan fick debutera i en helt ny genre! Båda dagarnas föreställningar inleddes av Mats Andersson och Elsa Björklund med ett nummer som Elsa uppförde i direktsändning i Musikhjälpens glasbur innan jul, många kände igen tonerna därifrån! Och stämning blev det i Teaterverkstaden efter förberedelserna! Föreställningarna och Teaterverkstaden inspirerade publiken. Café med pappersdocktillverkning till Balkanrytmer avslutade dagarna. Du tror kanske att du är en fri människa? Det finns det många som tror! Här ska du få se hög med ben och knotor hopsamlade från alla världens hörn i en liten kista när de möter en uppstoppad panda! Du får se en dockspelare som likt en glad alkemist skapar karaktärer, känslor och förvecklingar av tillsynes livlöst material. Utan att använda ett enda ord berättar jag en hop historier om ensamhet, man kan undra vem som är docka och vem är animatör, vem som lever och vem som är död! 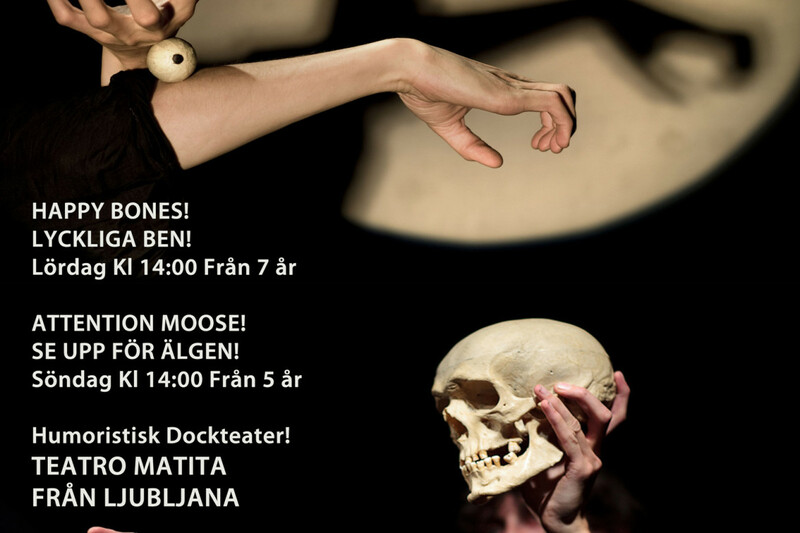 Här får du se objektteater i dess ursprungliga oblyga och råa form, oj vilka ändlösa möjligheter denna teaterform har! Någon har sagt att jag följer ett Dadaistiskt partitur, en svart komedi som i varje ögonblick ändrar åskådarens perspektiv, som överraskar, och får dig att skratta! Tills du plötsligt får upp ögonen för att du bara är en del i ett större spel, det där om livet och döden! Pjäsens musikalitet gör allt detta förståeligt för alla, säger de också. Och så här skriver han själv om ATTENTION MOOSE! Älgar som talar, tomtar som spelar kontrabas och hönor som kämpar mot skator. Tillvaron är oförutsägbar och ingenting är ju som man förväntar sig. Här överraskar säregna karaktärer, de får skrattet att bubbla och gråten att, nåja, lura strax under. 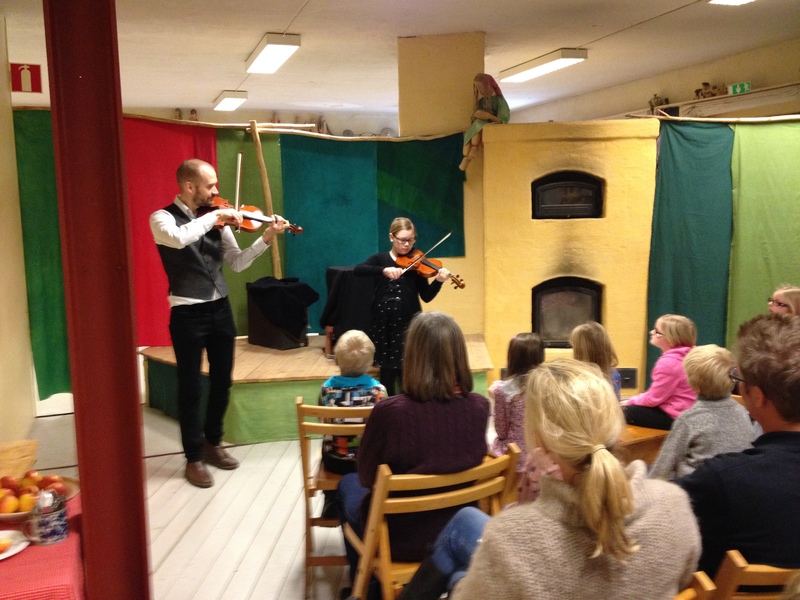 Dockteater på musikens villkor, med influenser från hela vår värld! Och här lite om Matija, en nylig intervju från hans turné i Australien, fin läsning för den som inresserar sig för det nya inom Europeisk dockteater! 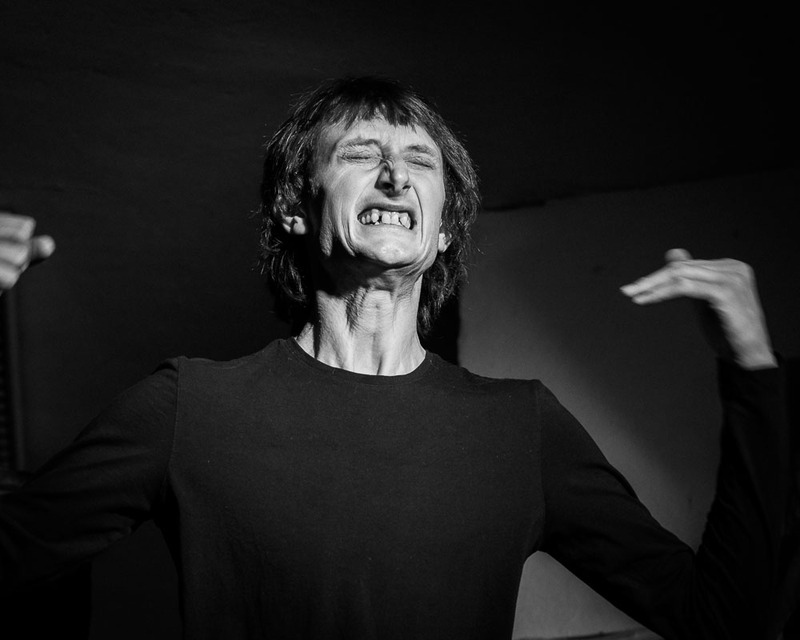 Matija Solce is a musician, puppeteer, actor, workshop organiser and mentor. 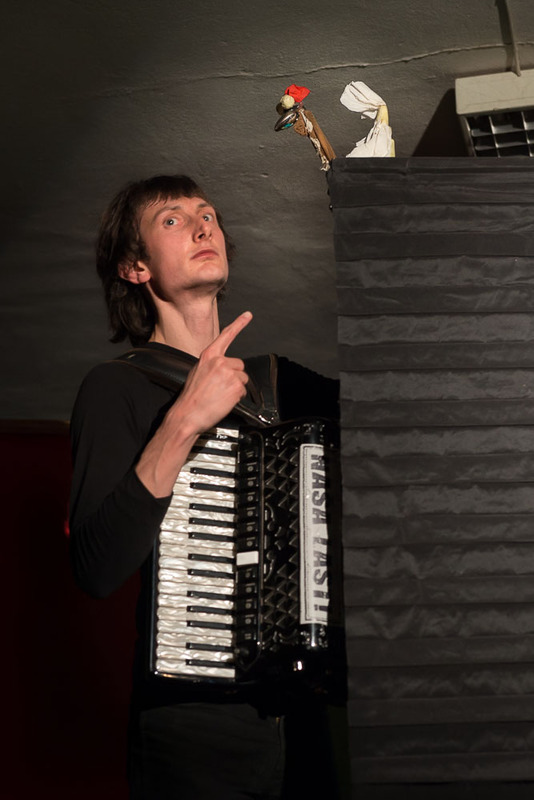 He is currently undertaking his doctoral studies in Alternative Theatre and Puppetry at the Prague theatre academy (DAMU), on the theme of “The musical perspective of puppet theatre”. 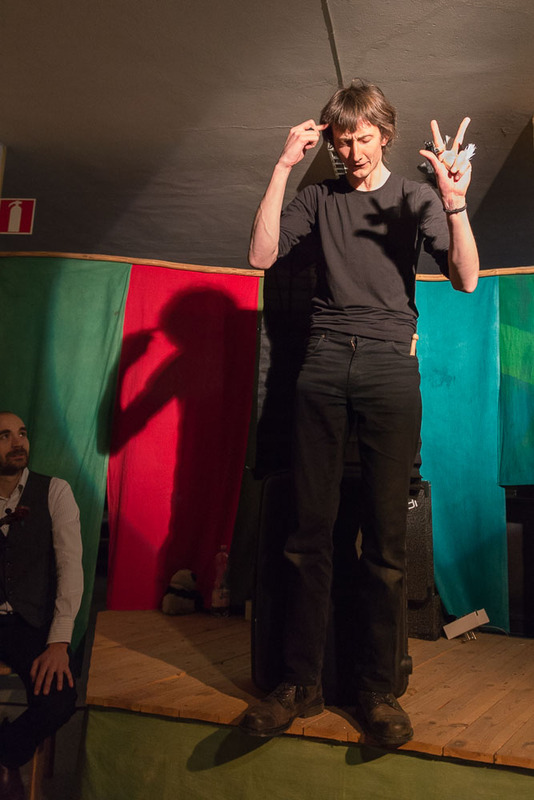 In his works he closely connects music and theatre, and therefore his concerts often turn into interactive theatre performances, or his puppet shows become musical compositions. 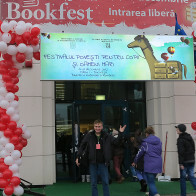 Matija is the director and founder of the Histeria Festival, held annually in Hitria, Slovenia. 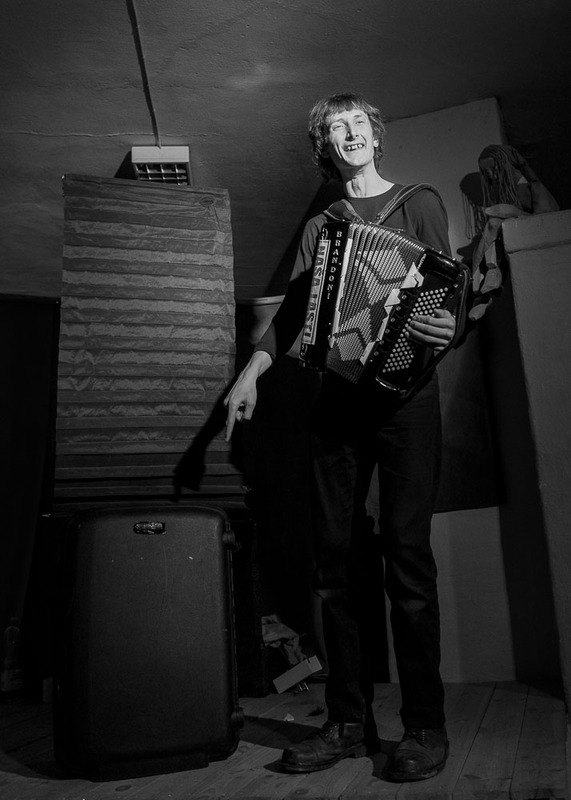 Matija is also a founder and leader of the super-group of traditional music, Ethno in Transit, and a founder with Nano Stern of the ground breaking duo, Folkoholics. Matija is the founder of Ethno Histria (Slovenia) and has led Ethno gatherings in Scotland and Australia. In 2009 a production ATTENTION MOOSE! was created. It is a simple story about the relationship between man and nature with folk motives from Europe and Latin America that give music an important role in expressing the characters and the atmosphere. Teatro Matita was established in 2002 by musician and puppeteer Matija Solce after he had completed his studies at Bruno Leone’s traditional Italian hand puppet school in Naples. He tries to stimulate the audience’s imagination with his belief that everything can be a puppet (from the most usual everyday object such as a bicycle bell to the more unusual such as a bone), performing all over the world in all kinds of places (theatres, outdoor stages, prisons, schools …). Considering his musical education and collaboration with folk musicians it is not surprising that music plays an important role in his work. His productions are often a combination of puppet show, folk music performance and acting (an actor is also a puppet). While some larger festivals in the Australian music scene are struggling and some even cancelling, it seems that it’s the time for boutique events to shine. According to Glenn Wright, director of Mullum Music Festival, ticket sales this year are up 20 per cent. And the reason, he believes, is affordability, accessibility and the trust that has been built up with the programming. People know it’s going to be interesting. Opening night at the Mullum Music Festival is Mullum’s ‘premier night of nights’. The night features artists coming from Iowa, Berlin, Slovenia, Gambia, Sydney, Melbourne, and also some very special guests. This year also features the dark theatrical genius of Slovenian puppeteer and performance artist Teatro Matita. Matita, can you tell me how you came to be a musician, puppeteer, actor, workshop organiser, and academic? It just goes naturally – when you meet many people through jam sessions, suddenly you start organising jams, making arrangements, bands… and become a festival organiser yourself. 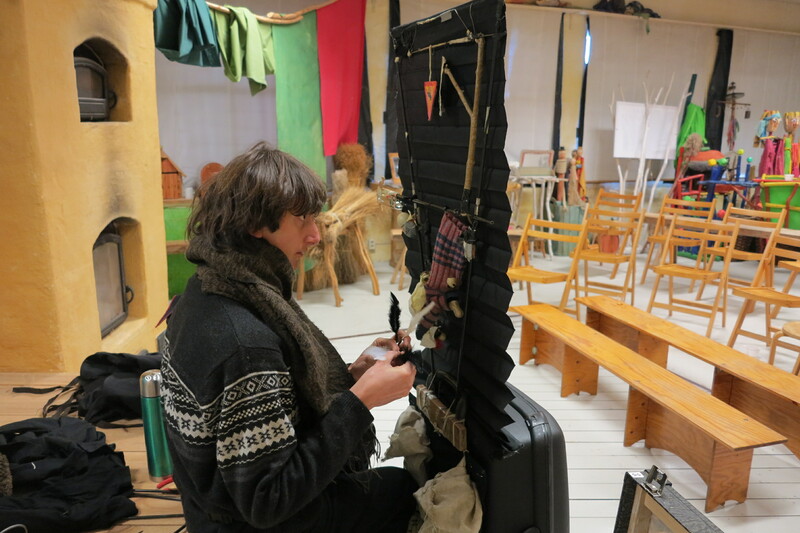 When you do puppetry on your studies, you want to make another step – you want your students to connect with other puppeteers as well as musicians. There is no typical day. 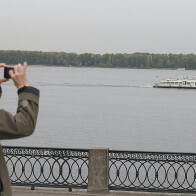 I am at present north of France; yesterday I was still in Vienna; a few days ago in London and after tomorrow, Russia. 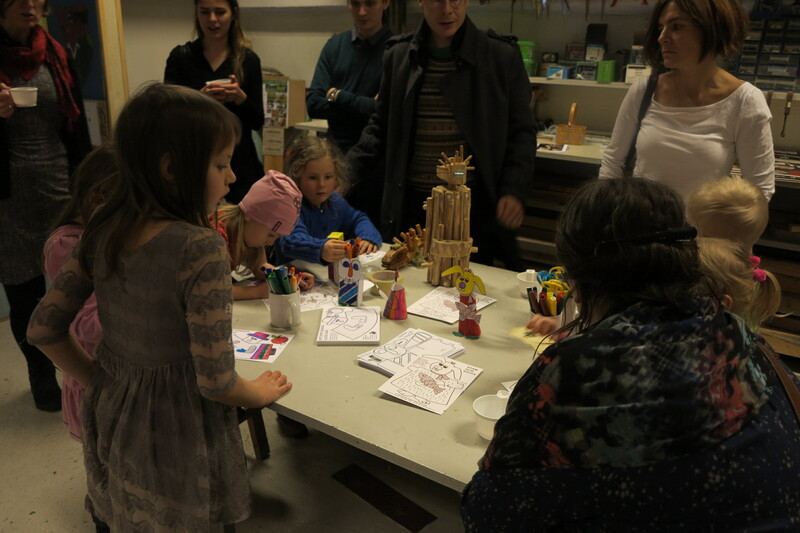 Today I am directing a show for children; yesterday I was playing three different puppet shows and adapting to an Austrian audience; in few days I’ll try a show in Russian, make a concert and go to play for orphans. What is the thesis you are working on for your doctorate? 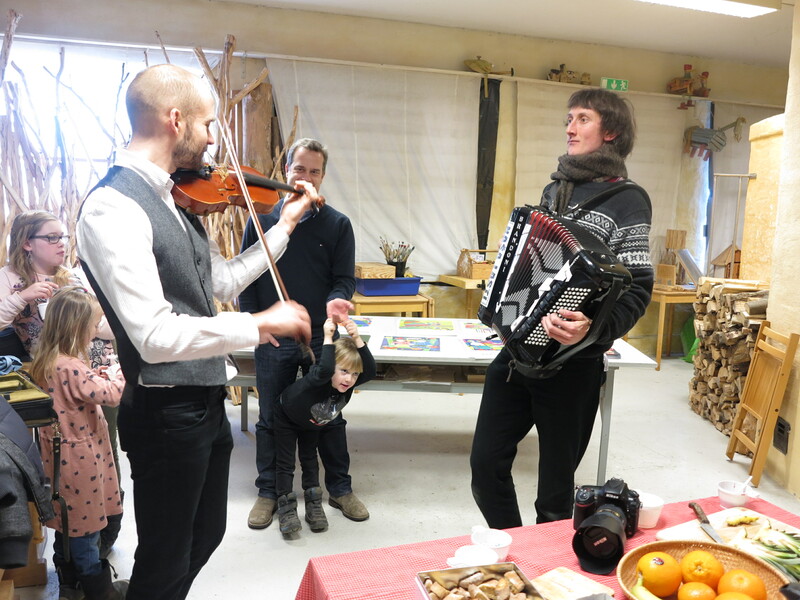 It is about connection, music and puppet theatre. 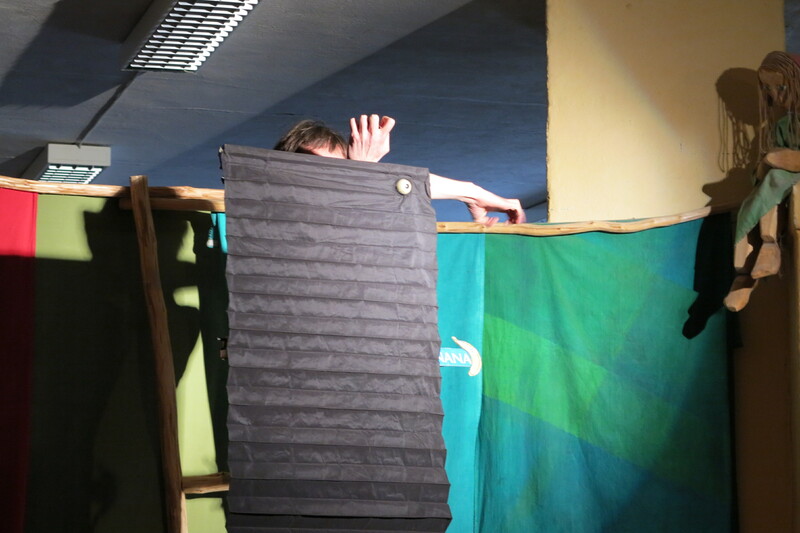 Puppet theatre is the most mobile, flexible, broad form of ‘contextual’ art. Only puppet theatre can include all forms of art: painting, acting, physical dance… At the same time, music is the most ‘sincere’ art – the most direct way of language, of communication. It is the most ‘physical’ art, when puppet theatre is the most ‘distant’, contextual, using illusion for mirroring reality – that is closest to music. 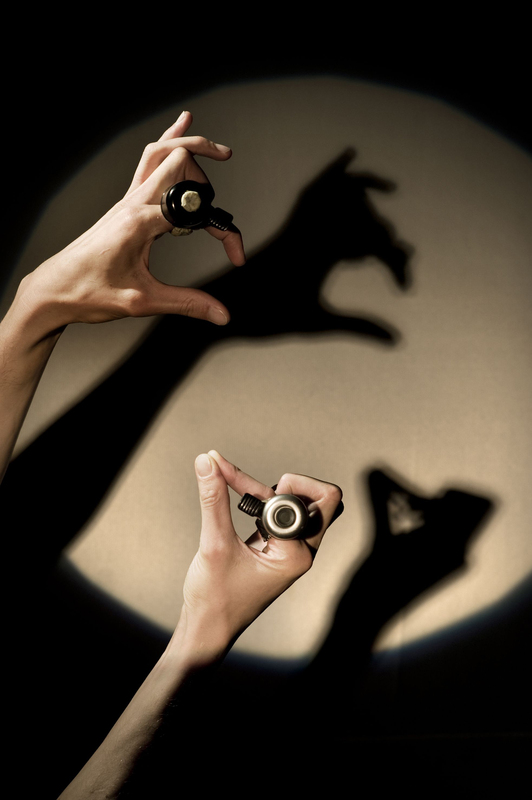 What role do you see something like puppetry and theatre has in this digital age? It is the beginning of social rituals, that were connecting with symbols of puppets and masks. Puppets have the ability to adapt, to change forms. Puppets are cheap, puppets are wide; you cannot arrest them if they say something wrong; you cannot judge them, even if they say truth. Puppets are our alter egos, and can have healing effects on society. How do you want your performances to affect people? I want to make people reflect, not necessarily be pleased. Do you still see a vital role for mythology and story? Yes. Well, the mythology connected to Now. It is one of the senses of culture that is the supporting base of art. It is not based on ‘pop society’, where each artist presents themselves as the whole culture. Where one person thinks, he is more important in the generation. It is the place of consensus, where art evolution comes to the root. And mythology is part of that root, which survived thousands of years and exited in the western world a few decades ago. That is scary. Mythology is not vital. It is one of the aspects that made the mirroring effect. And in this sense it is very close to principles of puppetry. That’s why mythology and puppetry are closely connected. Are you influenced by Living Theatre, Theatre of the Absurd, Theatre of Cruelty – or do you have your own personal distinct theatrical and philosophical manifesto? It is a mixture of commedia dell’arte, Theatre of Absurd, Bread and Puppets and… hmm, folk music? Surely Beckett, Brecht, Craig… I don’t have one idol. Definitely, art is not to be separated from society. It is – like Bread & Puppets said, for kitchens. Art is like bread. Art is cheap. Also, it is here to provoke, to be oppressive. It is here to talk. Art is here, to take the microphone and to talk with its untruthful, irrational intuition. No, I do not have my manifesto. 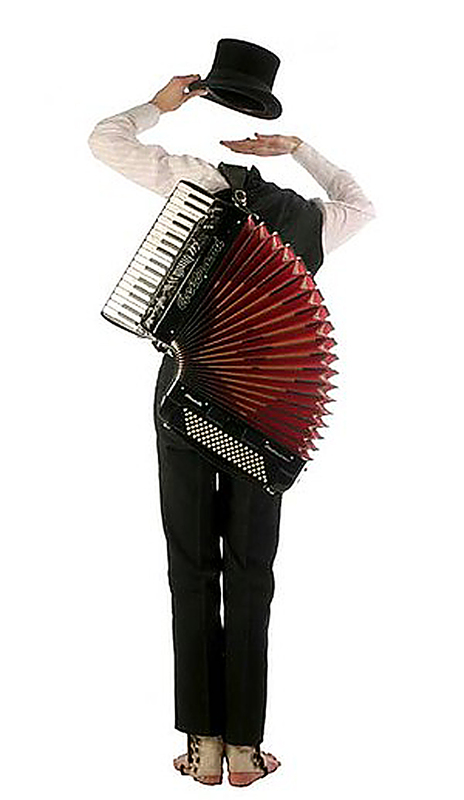 I’m just a musician when I play puppets, and puppeteer when I play accordion. What are the themes that you work with? What characters do you use? I started with Pulcinella. I went over different abstract, nonsense topics, fairytales, classics, and now I am coming back. One of my next shows is going to be a Slovenian character, Pavliha. Primitive art. That is my interest. 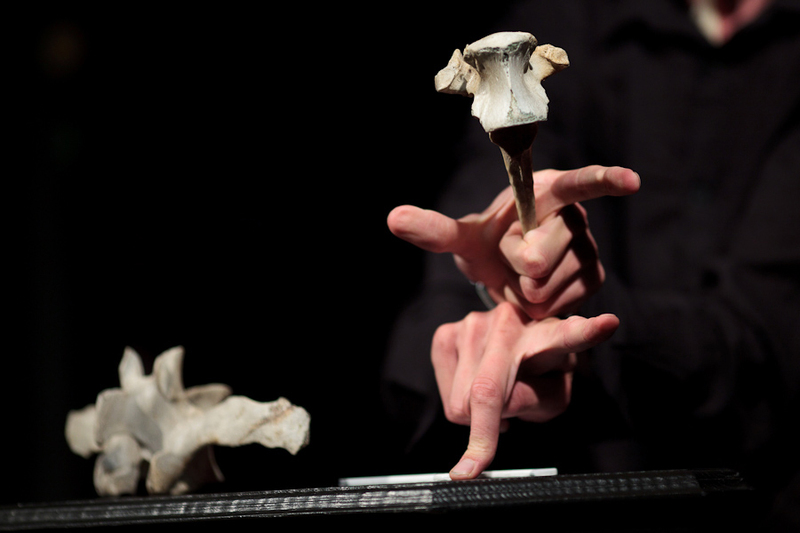 Also ‘happy bones’, which I perform only with real objects – bones, are primitive. I like this. How do you work up a performance? Is street performance still a vital part of creating an act? Creating on the street is vital. It is an essential part of my workshops to send students out. To try to communicate on the street, in pubs, in shopping centres with people who would never want to have anything to do with art. When I work on a show, I start from what I have. 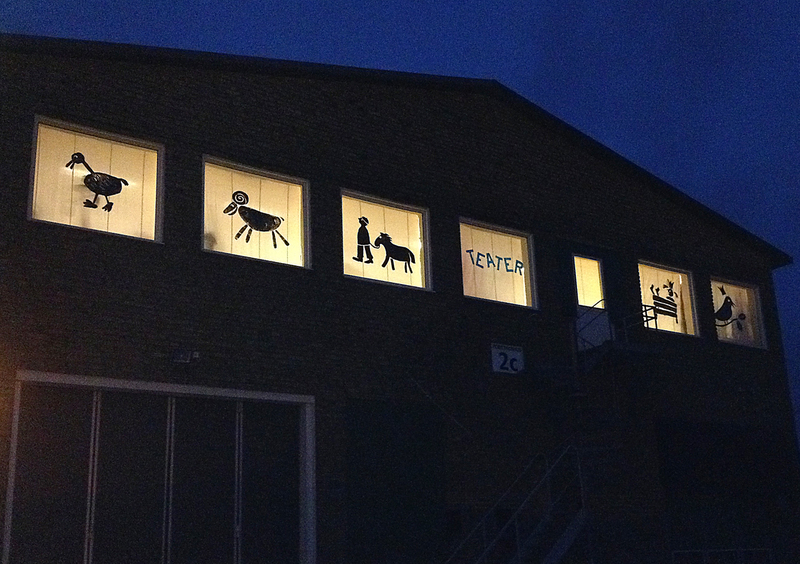 Site specific. Where am I? Do I have any money? How many hands will manipulate it? Then I go to music and rhythm, starting with steps, impulses reactions, situations. At the end comes composition. Gluing different parts together. Analytic principle is closer to me than one where you get text (storyboard) and than make the story after it. I take the story from the end and beginning and then fill it up with nonsense. How do you make a puppet show a musical composition? Every show is musical composition. Only thing is that I base on it most of the show. Mostly there is not music, or it is strictly connected to the animation of puppets. That why it is so much harder for actors in my shows: they have to think of situations in rhythm. 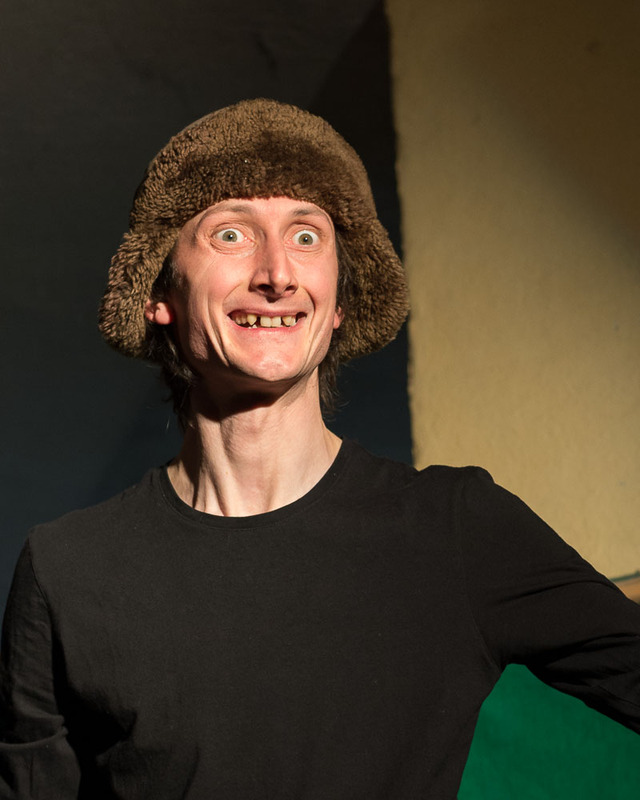 Smakprov, Matijas videor: Attention Moose! Happy Bones! Teaterverkstaden i Hög är Sydsveriges enda fasta dockteaterscen. Vi har nu arrangerat internationella gästspel här med grupper från Grekland, Ungern, Turkiet, Slovenien, och mer spännande är på gång!